“According to the declaration of World Conference on Education for All in 2000 Dakar, Senegal, 180 countries including Bangladesh adopted Education for All (EFA) goal by 2015. We are now very close to 2015. Many activities targeting Education for All (EFA) post 2015 goal have also been started in many countries around the world. 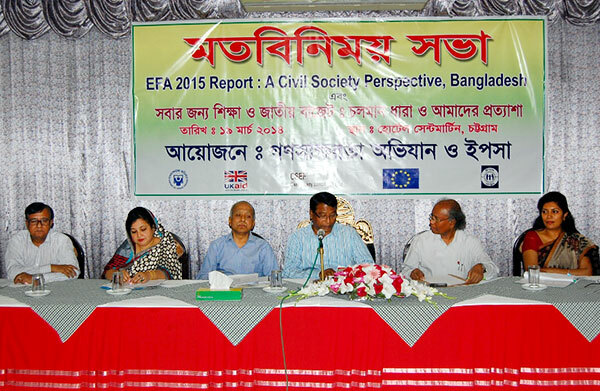 Bangladesh already has taken some initiatives to achieve post 2015 EFA goal by the government and non-government organizations. Bangladesh government prepared draft report in this regard. Besides, other draft report has been prepared by educationalist, researcher and non-governmental organizations. As Bangladesh signed the declaration in Dakar, Bangladesh is committed to allocate at least 20% of fund out of national budget or at least 6% fund from national income for the education sector. However, considering previous ten years of national budget, allocation for the education sector did not acceded 15% target anyway and it was below the ratio 2.5% of national income. According to the National Education Policy 2010, a permanent education commission forming is necessary” speakers made the comments in a function jointly organized by YPSA and Campaign for Popular Education with the support of UKAID, European Union and Civil Society Education Fund on 19 March 2014 at Chittagong. Md. Nazrul Islam Chowdhury, Member of Parliament Chittagong-14 was present as chief guest while President of Chittagong Peshajibi Parishad and former general secretary of BMA, Chittagong, Dr AQM Sirajul Islam presided the meeting. Two keynote papers were presented in the meeting. Professor Shafi Ahmed from Dhaka University presented the keynote paper titled “Education For All-EFA 2015 Report: A Civil Society Perspective, Bangladesh” and Ms. Rehena Begum, Deputy Programme Manager, Campaign for Popular Education presented the keynote paper titled “Education For All and National Budget: Running Trend and Our Expectations”. Mr. M. Nasirul Hoq, City editor of daily Suprobhat Bangladesh and Ms. Rekha Alam, City Corporation Councilor and President of Education Affairs Standing Committee were the panel speakers. Md. Shahidul Islam, program manager of YPSA gave the opening speech in the meeting. Representatives from civil society, journalists, members of the governing body of schools, colleges and madrasha, guardians and other educational activists from different districts participated in the meeting.